As the homeschooling market has grown in recent years, so have the number of companies seeking to entice you into purchasing their curriculum. But sometimes those materials and resources can cost a small fortune! What’s a budget-minded homeschool parent to do? Tip #1 – COMPARISON SHOP. For example, the 4th edition of Saxon Math 76 costs $103.60 today when purchased directly from the publisher, while you can get it at Christian Book Distributor for $82.89 and Rainbow Resource Center for $76.95. Look at more than just price, however. Discounters may have different return policies than the publisher or author does. This entry was posted in Business Venture Adventure, Homeschooling Information and tagged ISBN number, money saving tips, Saxon Math, used curriculum on July 27, 2014 by Penny. Ann’s post clarifies my tangled thoughts today as I leave behind a season of leadership at Hope Chapel Academy. My time in this particular job and ministry is over. My season of day-to-day mothering is over. Something new is about to be birthed. We have yet to see where Tools for the Home Educator will go — how God will choose to work through it. “You can have it all” — isn’t the whole truth. No matter where you — it’s never all easy. A crop is made by all the seasons and the only way to have it all — is not at the same time… but letting one season bring its yield into the next. each season makes a full year. There are a thousand ways to be stretched thin and it’s the stretchmarks that a woman wears that can be her thin places, giving her more of God. The only way to have it all… is to have Jesus. And then like Him — to give it all away – one quiet wave of grace after another. This entry was posted in Business Venture Adventure and tagged Ann Voskamp, Having It All, Hope Chapel Academy, Looking Back on June 7, 2014 by Penny. Wow, Tools for the Home Educator is underway! Next month you’ll be able to find me at 25202 Crenshaw Blvd. #219 in Torrance. It’s a smaller space than I had originally planned, so I won’t have as much room for used curriculum or comfy chairs for browsing as I would like. But this space (188 square feet of office plus shared conference room and receptionist) is just the beginning – I can move to a bigger location as the business grows. Starting with a smaller initial financial outlay seemed the smarter way to begin. Soon I’ll be looking for donated or inexpensive office furniture and bookcases. I’ll let you know the specifics as soon as I’ve graphed the dimensions of the office and figured out how to squeeze the most out of the available space. And later, I’ll be ready to start accepting donations of used curriculum and to begin buying your gently used teaching resources. In the meantime, please continue praying for the Lord’s leading in this business adventure and for the myriad details I still need to take care (opening a bank account, getting a resale permit, choosing a logo, and coordinating advertising – just to name a few). 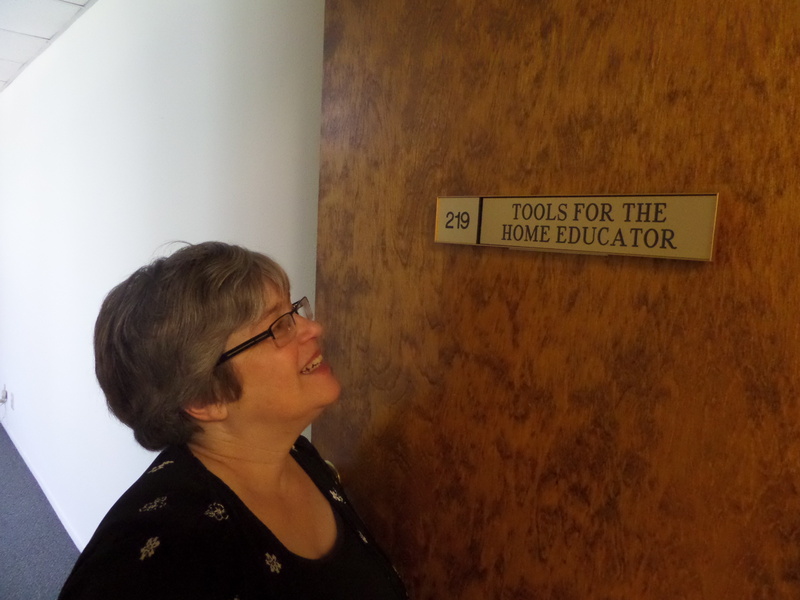 Tools for the Home Educator –Advice, Books, and Classes! This entry was posted in Business Venture Adventure and tagged homeschool resource center, used curriculum on April 25, 2014 by Penny. A Homeschool Business? Is it Possible? Imagine a room filled with tall bookcases of gently used, relatively inexpensive homeschool curriculum; a plush, cozy rug; and several comfy, cushy chairs. Add a coffee pot, tea kettle, and an experienced homeschool mom/leader. The result will be a homeschool oasis; a place where parent-teachers will want to come to peruse teaching resources, gather useful tips and techniques, ask questions, and receive prayer, encouragement, and inspiration for educating their children at home. In addition to the bookstore, services offered will include curriculum counseling,individualized consultations, and workshops. The plan is also to serve as a clearinghouse to inter-connect the many homeschooling resources and programs already available in the South Bay community. Ideally there will be adjacent space available for use by group classes and tutors. There is no need to duplicate services already available, but rather the need is to better match parents with existing resources and then augment as needed. This entry was posted in Business Venture Adventure, Homeschooling Information and tagged christian homeschoolers, homeschool resource center, used curriculum on March 26, 2014 by Penny.